Disclaimer: Links of products in the description are affiliate links that let you help support the channel at no extra cost. Welcome to Stayf Draws. I love animation and love to read about animation.Especially 2D animation.I think those movies are more versatile in style. From a young age I was very interested in Disney animation and how they were made. You only had a few books that showed little bits of how the animation was made. But nowadays there is a plethora of books about Disney animation. The Disney Studios has the biggest archives of all animation studios so they have a lot of cool stuff to show. Disney Editions decided to publish a series of books called the Archive Series. In this video I going to show you the book Layout & Background. It is the fourth book in the series. The book has forward by John Lasseter. The CEO of the Walt Disney Company. In the book you see a lot of samples of the layouts and the final backgrounds ranging from artwork for Oswald the Lucky Rabbit in 1928 to The Goofy Succes Story from 2011. Disney Animation always had the greatest artists working for them. Most of the time you look just at the animation. But the backgrounds create the mood of the story. It is like rhythm section in a big band that supports the entire tune. Not to obvious but more of a big support to the overall story. In this book you see great samples of different artists that all had to work in a certain style to keep the style of the background art consistent. On one hand you had the layout artist that got instructions from the director where the character would move. The book shows great art of most of the Walt Disney animated Features like Snow White and the Seven Dwarfs. All of these backgrounds where painted in watercolor. It wasn’t until the late forties that the background artists started to paint with gouache. I was surprised to see two animation pegs at the bottom of the drawing. These pegs hold the drawings in place on an animation desk. I always thought they worked with the five pegs system. They changed it to the 5 points pegs to get a better registration of the animation and that the animation would be more accurate. So it must have been up to 1935 that The Disney Studios used the 2 peg system. It also shows the intricate art of Sleeping Beauty. The style came from the artist Eyvind Earle. He worked in a very elaborate style and used gouache paint as well. He did not paint all of the backgrounds, so het had to art direct all of the other background artists at Disney how to paint in his style. The style of the layouts and backgrounds changed in each movie. Here is a background of Tarzan. The background is painted in a very lush style. On the bottom of the painting you see the color mixes to paint the background. 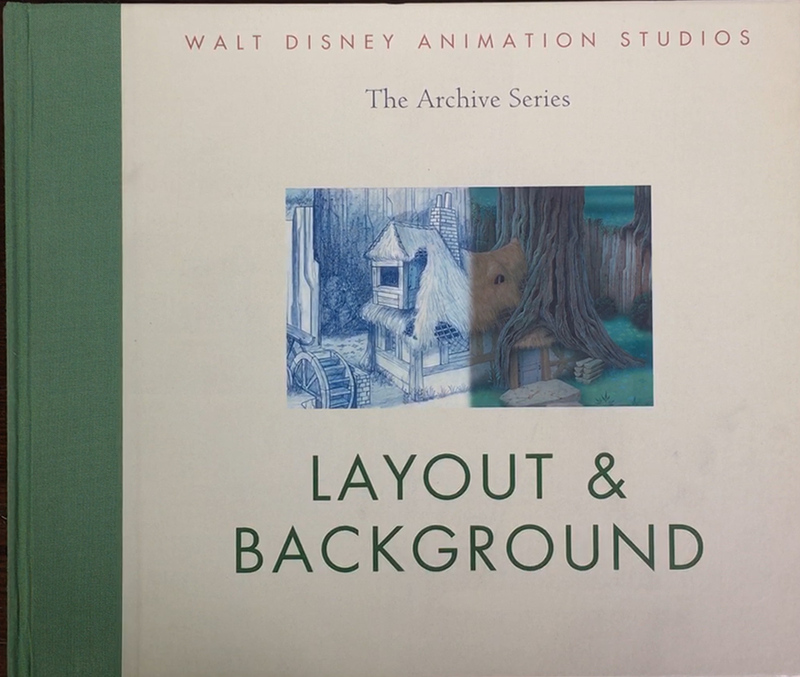 Layout & Background (Walt Disney Animation Archives) is a great book that gives a good insight in how the backgrounds were painted and that the two departments worked closely together to enhance the story with the right atmosphere. It is a true inspiration and a must have for all artists that are interested in animation and the art of the Walt Disney Studios.